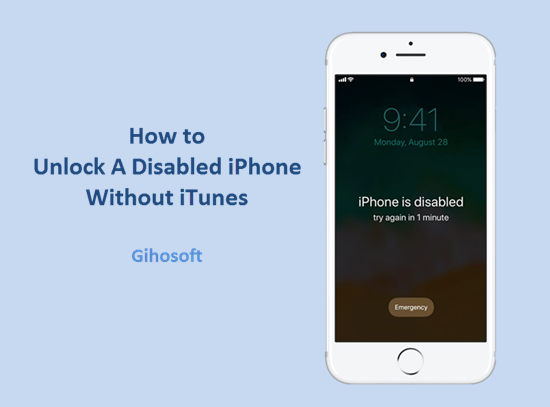 Home > iPhone & iPad Tips and Tricks > How to Successfully Unlock a Disabled iPhone Without using iTunes and Data Loss? Since Apple iPhone is an expensive smartphone, you’d better use the device carefully because repairs are costly and time consuming. Generally, to stop others from getting access to your data, they will have to enter the exact pass code if you’ve set one on your iPhone. But what if the wrong passcode was enter so many time that your iPhone is disabled? You may wonder if there’s any way to easily unlock a disabled iPhone, and better, not having to use iTunes. Therefore, we will show you the steps to unlock a disabled iPhone without iTunes, meanwhile avoiding any data loss. If you forgot your passcode, after a limited times of wrong passcode, your iPhone will be disabled and prompt you to try later; but if you still can’t get it right, you will see this message: ‘iPhone is disabled. Connect to iTunes’. Hence the best way to unlock a disabled iPhone is to use iTunes. However, we can’t have iTunes close at hand anytime anywhere. Fortunately there are alternatives such as iCloud to help you achieve the desired task. Just follow the below steps to unlock a disabled iPhone with iCloud. You need to navigate to iCloud.com and log into your account. 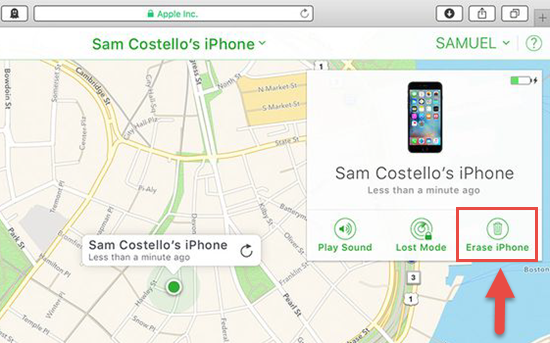 Visit the Find iPhone section and select All Devices option. You will then view a list of all Apple devices linked to your Apple ID. You need to tap on the name of the disabled iPhone. The iOS system will then prompt you to confirm the action because erasing will completely delete all your data. After unlocking a disabled iPhone, the device will be reset to factory settings. Moreover, the content including images and videos will be removed. So before you follow this method, please think carefully and make sure you have backups available for later restoring. Note that the method needs you to activate Find My Phone feature previously, though you don’t need to worry about because it’s activated by default unless you turned if off in iCloud settings. No matter what way you go with, to unlock a disabled iPhone, all the data stored inside the device will be erased. Hence, you should capture a backup of your iPhone data before performing a factory reset. But how to back up files if the iPhone is in disabled state? As you can’t use iCloud in this situation, you should make use of the Backup function of iTunes. You can easily create an iTunes backup, and later restore iPhone data from the generated backup file after enabling iPhone. Note that these steps below only works if your iPhone’ve synced your computer before iPhone is disabled. Open iTunes and establish connectivity between your iPhone and the computer. If you haven’t sync your iPhone with the PC before, you will be stuck here as you can’t tap on “Trust” to let iTunes access. Select the device icon located at the upper left corner to enter the Summary windowand select Back Up Now button to initiate the backup process. Or you can click on Files at the menu bar and select Device > Back Up to start syncing. After completion of the backup process, you can start to unlock your disabled iPhone without losing data. And after you’re done with unlocking iPhone, you should connect the device to iTunes and restore iTunes backup to get back all your data on iPhone. If iTunes doesn’t give you respond when you trying to create a backup before unlocking the disabled iPhone, you can always use the professional third-party software Gihosoft iPhone Data Recovery to extract important data from iOS device. This software supports all iOS devices with all iOS versions, and it can also help you to recover deleted/lost data from iPhone or iPad even without backup. Step 1: Run Gihosoft iPhone Data Recovery on your computer, and select all data on the interface. Step 2: Connect your iPhone to computer, and click Next to start scanning. 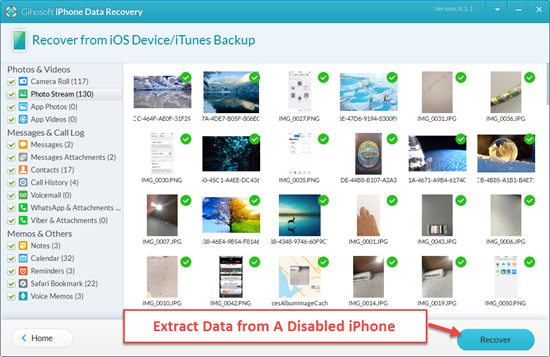 tep 3: Preview the result and click “Recover” to extract all data from iPhone. If you work with high-end smartphones such as iPhone, you should learn the tips and tricks associated with the usage of the device. You don’t need to worry if your phone is disabled because you can unlock the device easily following the steps mentioned above. Just remember to make a backup in advance to avoid losing data during the process.